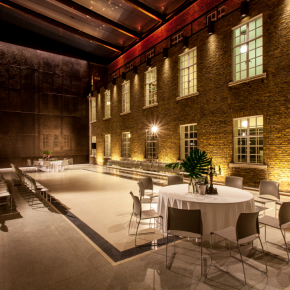 Hackney Town Hall has been the subject of an exhaustive 12-year and 12,500m2 restoration and refurbishment programme throughout which it has remained fully open. The folded bronze anodised aluminium panels were installed at the end walls of two underused interior service courtyards that have been transformed into full-height multi-functional atria as part of the redevelopment. 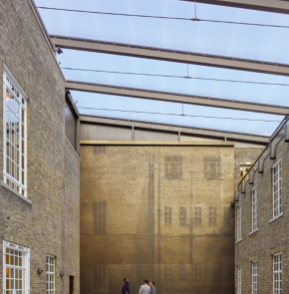 The wall panels were perforated to mimic the original walls behind in order to conceal new ducts linked to the smoke ventilation system and absorb sound with its acoustic fleece. Some 110m2 of the 1.5mm WH-1000 2m x 1m panels, which also feature a butterfly effect, where random perforations have been fabricated into “wings” to dapple the light, were installed by specialist Omega sub-contractor Roskel Contracts for main contractor Osborne onto a lightweight steel framing system on the walls at the eastern ends of the north and south atria. The wall panels were then complemented by the addition of anodised trough boxes containing continuous strips of LED lights at the top of each three-storey wall. Specifiers Hawkins/Brown created two abstract images of each original windowed brick wall using the computer programme Grasshopper through which they programmed in the technical and aesthetic parameters and “plugged in” photographs. In the new atria, the brickwork is topped by a continuous steel ring beam that supports the new ETFE roof spanned by secondary beams. The former service yard’s basement floor has been raised to ground-floor level to allow level access from the refurbished marriage suites which now open onto the new atria’s resin terrazzo floor. As well as creating 66% more office space, the refurbishment of Hackney Town Hall, as part of a wider masterplan for the London Borough of Hackney, has made the building more energy efficient. During the programme of works, 97% of waste was diverted from landfill.